Located near the intersection of S Lincolnway St and Sullivan Rd, Extra Space Storage serves residents of North Aurora, Aurora, and Naperville. Locals will recognize our facility behind Popeyes Louisiana Kitchen and Denny's just north of Presence Mercy Medical Center. Are you a college student looking for self storage close to campus? Extra Space Storage is about 4.5 miles from Aurora University, providing accessible options for summer storage or storage while studying abroad. 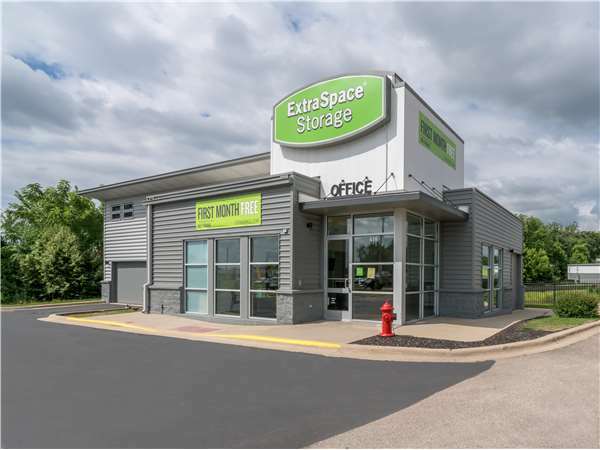 Extra Space Storage on S Lincolnway St can accommodate residential and commercial storage needs in North Aurora with a variety of storage units, climate-controlled storage, drive-up access, and more. It's easy to store items of all sizes at our North Aurora storage facility! With unit sizes from 5x5 to 20x20 and unit features like first-floor access and drive-up access, we can handle practically any storage need! With security measures like individually-alarmed units, electronic gate access, an on-site resident manager, and 24-hour video surveillance, you can store valuable items with confidence! Climate-controlled units stay between 55 and 80° throughout the year, protecting delicate items from extreme heat, humidity, and cold. Units with climate control are available in sizes 5x5 to 10x30, and some even include drive-up access for added convenience. It's easy to store large, heavy items with drive-up access! You can pull a vehicle right up to your unit to quickly move items in and out! Drive-up units are available in sizes 5x10 to 20x20. Not only does Extra Space Storage maintain a secure, clean facility at all times, but our customer service is the best in the business! Our friendly, professional staff truly cares about our customers, and they go the extra mile to deliver an excellent storage experience. Contact us today to reserve a storage unit in North Aurora! Best location I have used to date! But all of their stores have helpful and friendly customer service! I wouldn’t store my things any where else! Clean and spacious! Wonderful customer service. Clean and secure location. Clean, secure facility. Friendly and knowledgeable staff. Would defenately use again and recommend to friends and family. I highly recommend them! They were so helpful and positive at making sure I had a good experience and good place to store my stuff in. First time with and definitely will be going back if I ever need to store something again. Great friendly staff. Facility was clean and well kept. Fast,easy provides with really good & honest recomendations By Kevin at Aurora IL location & also Excellent customer service . I have a sports car that I store every winter. Extra Space is the third company I've used in the last three years, but I can't imagine using anyone else going forward. And I had very positive service from the previous two! VERY clean facility. Everything in fine working order. Appears very secure. Exceedingly friendly and helpful staff. Staff answered l my questions, we're great when I showed up for move in and had great follow up. No thy managers checked in with me to make sure the move went well. Great place. Clean, Safe, Location was good! Very professional, well maintained property and security first rate. Caring, helpful staff. VERY clean and accessible. Experienced personnel and easy to work with. No nonsense just facts and quick to deal with. Quite convenient too! Everything is handled fast and with great care. The store personnel could give better deals on site instead of calling the corperate heads. The facility is very nice. We are very impressed with it. It is easy to get to and seems to be very secure and we don't worry about our things getting stolen or ruined. The people that work there seem very nice and very helpful. The staff was very helpful..extremely polite. The security is very good. They alerted us to an improperly secured door on our unit. I don't agree with the mandatory insurance. To me..just another money making gimmick for storage companies. It should be optional. Went in close to closing time and a line formed, but the girl there was still very friendly and helpful to everyone that was there. She even came around to our storage location to make sure everything was up to par. The storage spaces are very clean and not very buggy (we hate bugs!). I am impressed with Extra Space Storage and have referred a friend to them. Easy to get in and out, large and clean spaces. Also convenient to I88. No wet belongings during the flooding in April 2013. THE GROUNDS WERE VERY CLEAN, AND I FELT VERY COMFORTABLE WITH THE AMOUNT OF CAMERAS AND SECURITY TO PROTECT MY BELONGINGS. THE MANAGER KEVIN WAS VERY KNOWLEDGEABLE, PROFESSIONAL, COURTEOUS, AND EXTREMELY FRIENDLY. I WAS WALKED THROUGH THE PROCESS WITH NO PROBLEMS. I WOULD RECOMMEND ANYONE LOOKING FOR STORAGE TO USE EXTRASPACE STORAGE AND TALK TO KEVIN. I shopped at 3 or 4 other places, and these guys have the best of what I need. Great price, it's right off the highway, very helpful people there, and it's good to know they have a lot of security and that they cut off access around 10pm. I wouldn't like the idea of strangers roaming the place all hours of the night. I haven't done it yet, but they give $50 off my rent if I refer someone! Very good place, meets all my needs for long term storage requirements and friendly people maintaining the place. I would definitely recommend Extra Space Storage to all my friends for their storage needs. I worked at another storage facility and it was cheaper for me to store here than where i worked. This is the second time I have stored with Extra space and I would do it again! The office was the first thing I noticed. It was neat and clean. The storage unit I needed was a 10 x10 climate controled and was also neat and clean. The storage unit I was shown was the unit I rented. I looked around at different competitors and no one matched the price and cleanliness. The people who run this facility are very helpful, friendly, and the storage areas are always impeccably CLEAN! I can rest assured that the belongings I have stored are safe! Thank you! I have been a customer for over 2 years and have found the Staff to be great and the facility is always clean and neat. Hours of access are a bit short; currently open from 6am to 10am, I would like to see the hours extended to 12 midnight, other than that Extra Space Storage meets all my storage needs. The manager and her staff are professional. The price for our storage is great! This facility is well-maintained. Drive southwest on State Rte 31 S. Cross I-88 and continue straight. Our facility will be on the right after Popeyes. Drive northeast on N Lake St. Continue onto S Lincolnway St. Turn left onto Lovedale Ln. Turn right in front of Cinemark Tinseltown USA. Turn right onto S Lincolnway St. Our facility will be on the right after Popeyes. Drive west on I-88. Take the IL-31 exit toward Aurora. Turn right onto IL-31 S. Our facility will be on the right after Popeyes. Drive east on I-88. Take the IL-56 E/IL-31 E exit. Turn right onto S Lincolnway St. Our facility will be on the right after Popeyes.